The sword on the ground is very clearly a Type A with a horned handguard. 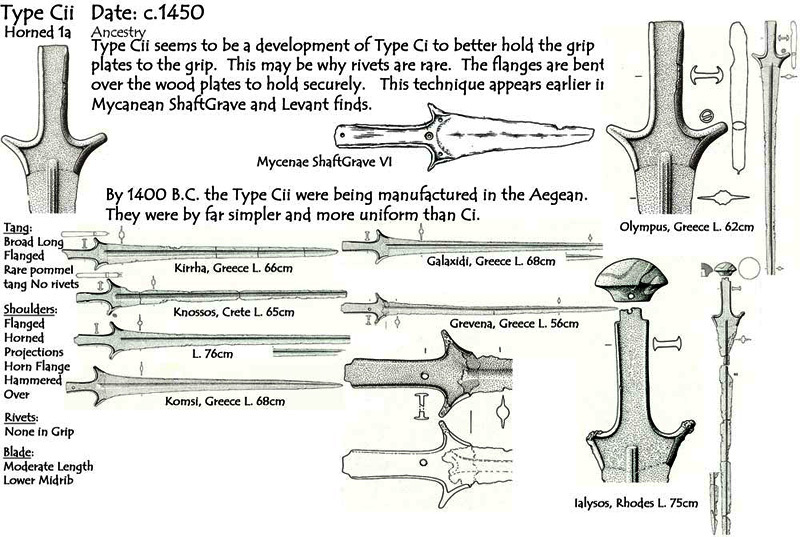 The following example matches it precisely and was found in shaft-grave V from Mycenae. It dates to the same time period as the sealstone. The other one is most likely a Type B. At this time period in the Aegean the spears were two-handed. 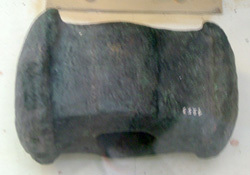 The shield was controlled by means of the shield strap. The Lion Hunt dagger show this the best. The only difference is that they are using figure-8 and tower shields instead of circular/ovoid ones. Sword scabbards at the time were carried on shoulder baldrics, not waist belts, and tended to ride a lot higher, closer to the armpit. Whatever it is there is another example on the ground to the right. It could be a stone mace but the one of the ground doesn't have an obvious hand grip. 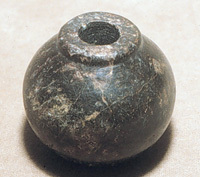 Edit: This marble mace head was found on the Ulu Burun shipwreck and dates to around 1300 BC, so we know they used stone maces right through to at least this period. Unlikely. 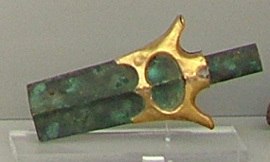 Type G swords date two-three centuries later than this sealstone. Keep in mind that weapons, armour, and the way of fighting changed just as much over the last few centuries of the Bronze Age as they did during the Middle Ages. What we see in that sealstone has as little in common with Homeric warfare as the Battle of Hastings has in common with Agincourt. Sword scabbards at the time were carried on shoulder baldrics, not waist belts, and tended to ride a lot higher, closer to the armpit. Whatever it is there is another example on the ground to the right. It looks like a stone mace to me. 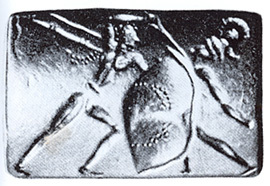 This seal impression shows a very similar battle scene as the above agate and gives a better idea of how high sword scabbards were carried and what they looked like. There is no big ball on the end of this scabbard or any other - there is no evidence suggesting that any scabbards at the time had rounded protuberances on the end. The item on the ground doesn't look much like a mace either, but, based on the available evidence, it is unlikely to be a scabbard. Without something to corroborate this interpretation it remains speculative. This is a common motif (there are at least four items depicting the same scene) and IMO is showing a duel between two legendary characters who would have been famous at the time. I wrote earlier that I hadn't seen anything in other Minoan/Mycenaean art to match this, but here is another Minoan sword that might come close in the depiction of a human figure.. I picked up this drawing a few years ago and don't have any provenance or history for it. Your drawing is of a sword found at Mallia and dates to around 1600 BC. The sword on the ground in the above agate seal is a Type A with a horned handguard. We have extant examples that match it dating to the same time period. The photo I posted above matches it exactly. This one, also found at Mycenae, is similar but dates a little earlier. I have to admit, I wasn't aware that any Sandars types prior to C had horns. That would seem to mean that the typology charts I've been looking at are all either incomplete or outdated. This seal impression shows a very similar battle scene as the above agate and gives a better idea of how high sword scabbards were carried and what they looked like. There is no big ball on the end of this scabbard or any other - there is no evidence suggesting that any scabbards at the time had rounded protuberances on the end. [b]The item on the ground doesn't look much like a mace either, but, based on the available evidence, it is unlikely to be a scabbard. [/b] Without something to corroborate this interpretation it remains speculative. Thanks Dan for showing another example of this apparently once very famous combat motif. Interesting with the shoulder baldrics of the time in contrast to later waist-wearing. I'm not sold on these being maces either, as they seem hollow in one end and don't really look mace (neither the head or overall shape). So if not scabbards and not maces......? I think you are imagining the hollow end. A stone mace would be top on my list of possibilities. Metal maces had smaller heads. Mycenaean metal mace heads tended to be shaped more like a sledgehammer than spherical. The author gets a few gripes off his chest, mainly about false associations with Homer, and the "rewriting history" claims that are often touted when reporting new finds. The author, Matthew Lloyd, says both swords are Type C's. 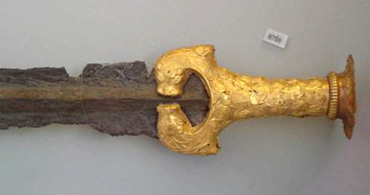 It is the same as the sword that was found in Grave Shaft V at Mycenae. It is an exact match. The traces of a giant stone-ship setting with cremation burial has been discovered near Vejerslev in Jutland, Denmark. It is almost 90 meters long and is the second largest found in Denmark, after the stone-ship-setting at Jelling for King Gorm the Old (died 958 AD), which reached the insane length of 354 meters. The Vejerslev stone-ship setting had a likely cremation grave at the center, where some unmelted metal parts were discovered, which made a dating to ~600 AD possible. The Germanic Iron Age and thus contemporary (~50 years later) with the great hall recently discovered at Lejre on Sjælland (Zealand). So a King or powerful Jarl got a spectacular burial. Today only 3 overturned stones remains of the structure, that probably were demolished in the middle of the 19th century. I recently came across an article discussing how the melting glaciers are revealing a lot of bronze and Iron Age artifacts and weapons. It appears that the glacier preserved a lot of organic material, to include a pair of skis. The only place I’ve seen organic material survive was in a cave environment. It will be interesting to see the research paper. Article on the Sandby borg fort massacre. Interesting read. Yes I'm looking forward to pics of both the Nordic sword and any Lombard ones. By the way, Matt, do you have the reference (which speech) for your quotation from Cicero? It is most appropriate for these times. Nice article on first century Germanic bog burial/memorial site. It mentions weapons in the opening, but doesn't dwell. Wonder if something akin to a Cherusker might have played any part. The deposition is likely 1) bones brought home from a battlefield far away (as they were deposited over 6 months after death) OR 2) an invading army - which lost - and that was deposited in the local bog of the victors. if 1) Unlikely to be Cherusker, but could be tribes in Denmark, that were briefly allied with them against the romans, which were brought back to their homeland. More easily carried home if dismembered and made package ready. if 2) It could also just be internal Germanic warfare with no connection to the Teutoburger battle or the Cherusker. Niels - I was speaking of a weapon in the manner of the Albion offering, not a person. However, good points. 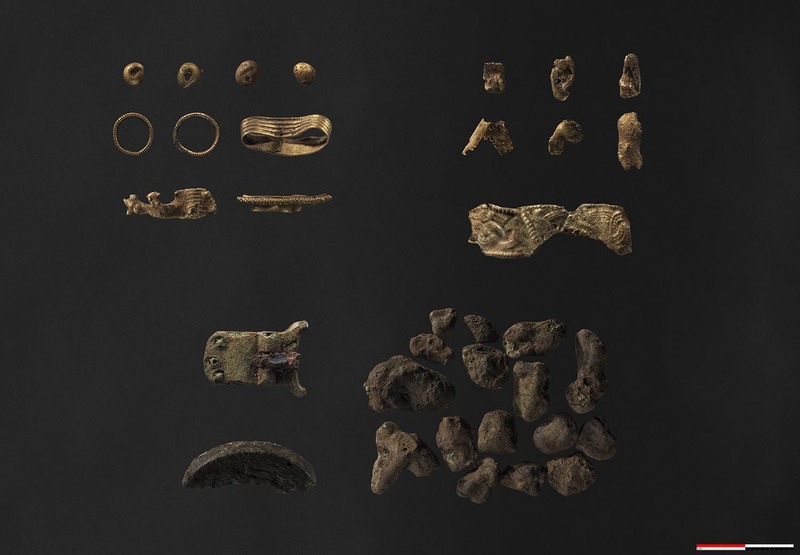 My take from what was in the article is that they were memorial/monument style deposits, and might actually be a mix of both suggestions given the mention of signs of animal predation on some the bones. I would suspect one might allow predation of an enemy rather than a comrade, but the predators can be quick, so that isn't exactly a sure sign of the bones being of one versus the other. Sorry my misunderstanding (I thought you meant the people Cherusker). Sadly it seems there are very few weapons, so they must have been deposited at some other site. The Albion "Cherusker" is based on the weapons found at the Hjortspring deposit in Denmark 350 BC, so it is certainly possible that they also were present at where ever this battle took place. If we read the Norse scaldic poetry there is a lot of mentions of giving the ravens/eagles food. The battlefield after the battle is called a "Val" - the place of the slain. Val-hal is thus the "hall of the slain on the battlefield". It seems very likely as a part of their religion/culture, that you let birds of pray and wolves feed on the slain for a period of time. Prominent men slain were possibly taken for separate burials, but the normal soldiers could perhaps have been scavenged and then later (6-12 months) the bones were collected; and then deposited in Alken Enge. Could even be that ravens/eagles/wolves were seen as Psychopomps ["Soulguides"], that by scavenging the dead brought the slain's "Hugr" [Mind/Personality] to the afterlife. In this early time period possibly everyone goes to Hel [Valhal is very likely a later development. Post ~ 550 AD?]. It could be a mix of both enemies and own people; only enemies or only own people. That question can possibly be answered by strontium isotope examination.